There is a reindustrialisation taking place in the middle of Oslo. Three young people have started their own business, making products as well-designed as anything coming out of Apple. The glass facade of the house in Christian Kroghs gate looks out over the Akerselva river. This is where industrialisation took hold in Norway in 1840. Water from the waterfalls powered factories. Today the electricity is everywhere. The air is full of wireless communication on a nearly unfathomable level. But the needs are the same as they were 180 years ago. Nobody wants to be lonely. The company we are visiting call themselves No Isolation. “We didn’t start out with an invention. We started with a need that had to be met,” says Matias Doyle, one of three founders at No Isolation. He is a systems developer and sits among a small ocean of computers on the floor which No Isolation has hired. 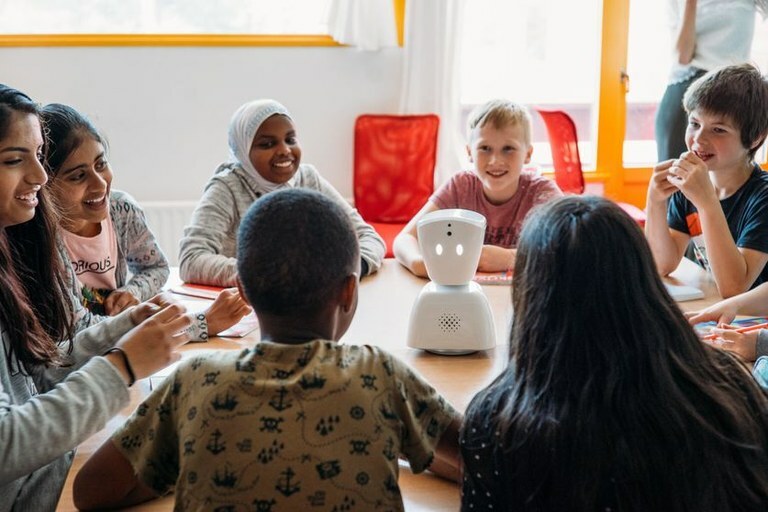 18 months after launching their first product, a robot which can be used by sick children to help them stay in touch with their school class, 42 people now work for them in Oslo. In Amsterdam they have 14 people, plus three in London. A total of 62 jobs have been created. Anna Holm Heide, head of communications, welcomes us and gives us the tour. She was the founders’ first hire. She explains how the white robot heads, which we can see on table tops around the office, work. “We call it an avatar,” she says. Avatar is a computer game term, the character which you control in the game. It is easy to think robot when you see the white plastic head. But the avatar does not have its own intelligence, it is purely an instrument for communication. The child who is ill can use it to see who is in the classroom. 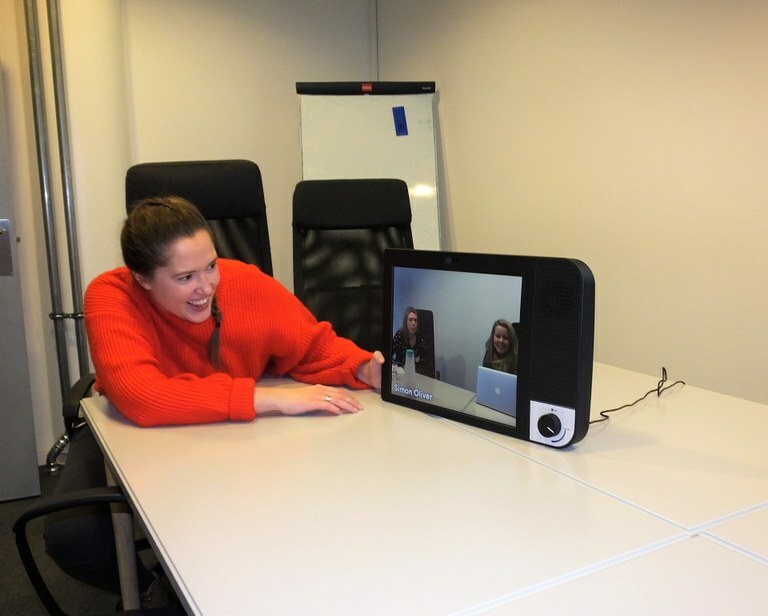 You could achieve the same kind of communication with an iPad and a communication programme like Skype. But something happens when the child is being represented by an object, which at the same time is solid enough to be taken out during breaks. “We have named the avatar AV1. It is a slightly boring name, but that is on purpose. The letters simply stand for Audio and Video, or avatar,” says Anna. 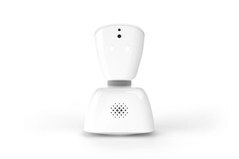 Right now, No Isolation has 370 robots placed in schools in eight different countries. The business idea is for schools or municipalities to hire the robot. It costs 24,000 kroner (€2,470) a year, plus a 1000 kroner (€103) monthly support charge. 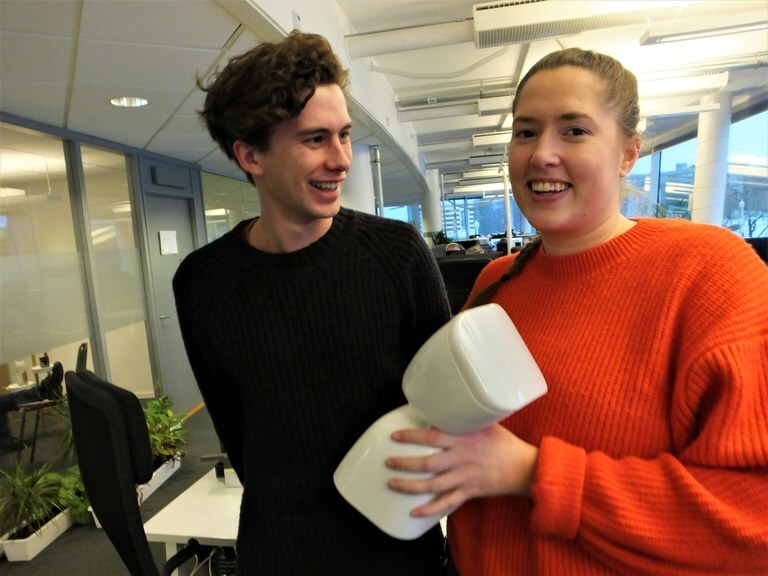 Private individuals can hire a robot for 19,000 kroner (€1,960) a year. The time spent away from school varies from child to child, and there are many reasons for their absence; cancer, ME, major operations, cerebral palsy and so on. But common for most is that they feel the isolation is worse than their actual illness. “There is a child with a long-term illness in one third of classrooms in Norway. That is 6,000 children in Norway alone. In Europe there are hundreds of thousands. We get requests from all over the world. It does not matter whether you live in Peru, Canada or Taiwan. Isolated children represent a problem everywhere. The two other founders alongside Matias Doyle are Marius Aabel and Karen Dolva. “Karen Dolva is the Chief Executive Officer for the group. Yes, we can call ourselves a group now, since the company in the Netherlands is organised as a daughter company,” Anna says proudly. Her background differs from those of the three founders, who have specialised in software, hardware and design. “I studied social sciences and have mainly worked with media and organisations. 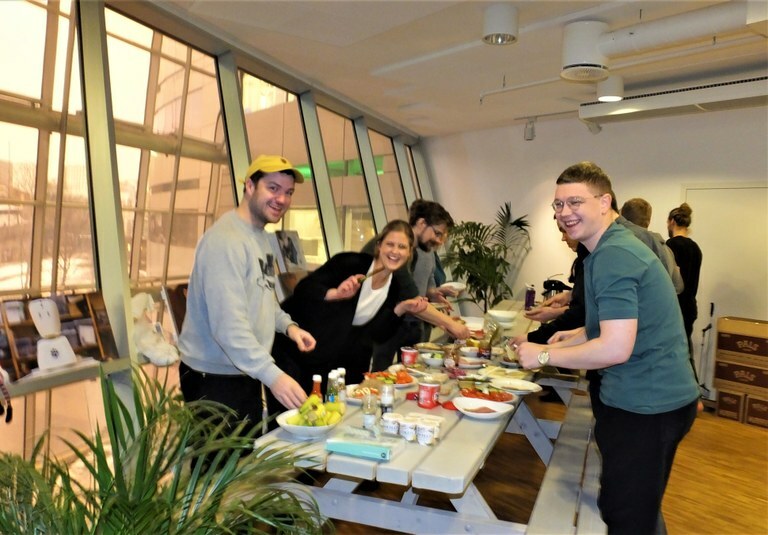 I was the leader for the Norwegian student organisation, and also spent one year working with the Winter Youth Olympics in Lillehammer. “I have done a lot of work constructing completely new businesses, so I thought it was fun to be asked for advice. But I never thought things would move this quickly,” she says. Marius and Matias used to work together in the oil sector. Karen joined because they saw that many of the gadgets being made were not very user friendly or good looking. Another product has just been launched. KOMP is a computer screen which can be used by elderly people who live alone or in a care home, to keep in touch with their families. This too has been made to be as user friendly as possible. There is only one button – an on/off switch which doubles as a volume control. Messages can be shown on the screen in large, white letters on a black background, or it can display the family members calling the elderly relative. An unlimited number of people can be linked to the communications system, and share the same information. “Could your technology not equally well be used by businesses for board meetings?” we ask. “Many have suggested that, but we don’t want to enter into that market,” says Anna. The reason being that the competition would then be some of the world’s largest companies. As long as the avatar and the screen remain niche products, they are protected against the risk of a far cheaper Chinese product taking over. “We have patented our solution to be safe. In order to protect people’s personal data, all audio and video is encrypted at both ends. No data is being stored and the actual avatar is password-protected. The company’s technology group hold their morning meeting in a room which looks like an IKEA play den. Anna points out that the gender division is not very good in this particular group. “But in total, the company consists of 46 percent women,” she says. 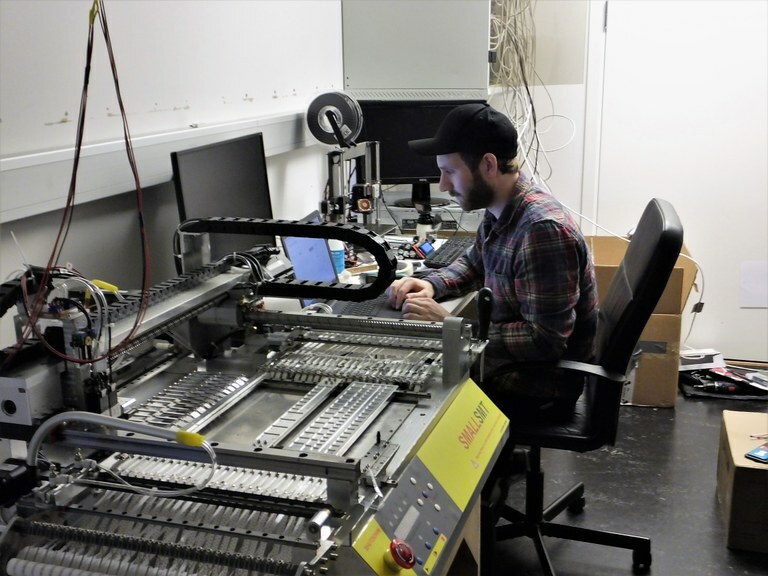 In a separate room, Øyvind Hodneland is designing a new circuit board. “The advantage of doing it ourselves is that it goes much faster. When the circuit board is finished, it is assembled in a factory at Tau outside of Bergen,” explains Øyvind Hodneland. Several 3D printers are lined up on a shelf. “We were able to make a prototype very quickly thanks to 3D printers which we could buy for a few grand. Earlier it would have cost many thousands,” says Matias Doyle. Keeping as much of the production in Norway also has an ethical side to it. How big are you in a few years from now? “Hard to say. But we will probably be three times as large, approximately,” says Anna. Each year more than 25,000 people start a business in Norway. Of these around 1,000 are between 16 and 24. 13,500 are between 24 and 44, and 11,000 are between 45 and 66. 800 people over 67 started a new company, according to Statistics Norway. The numbers are from 2015. At No Isolation most employees are between 26 and 32. “But we have some seniors too,” says Anna Holm Heide. What is the advantage of working for a newly founded company? “For me it is a lot of fun to be my own boss. I have already worked with many different tasks within the company; communication, marketing and I have been in leadership groups as Vice President for operations. “I have not thought that much about whether something might happen or whether the job is safe. That makes it a little bit exciting too,” says Anna Holm Heide. “I worked in the oil sector before, and that was definitely not safe,” says Matias Doyle. What are you looking for in the CV of people who want to work here? “Definitely no spelling mistakes! If the CV is in English, send it for proofreading with someone who really knows English! If there are typos, they end up bottom of the pile,” says Anna. “Those who come to us should also have a good deal of ‘idealistic competency’. They must believe in what they are working with.